Reidy Park Primary School is very proud of its modern and exciting Resource Centre. This area has been designed as a flexible learning space, with all furniture and some shelving moveable, allowing teachers to design the space to fit their lessons if they wish to. Our Resource Centre gives students significant access to fiction collections, catering for our junior through to our senior students. 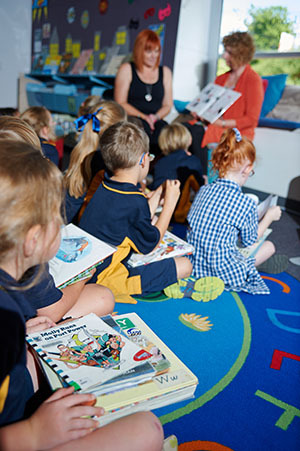 This includes an extensive range of series books for students to borrow for in school literacy programs and for enjoyment at home. Our magazine range is updated monthly and very popular among our students. Our non-fiction section is current and relevant, and is being more and more supplemented by searchable online resources. A computer lab is also located in our Resource Centre which is accessed by classes throughout the day and students at lunchtimes. Students have the opportunity to borrow in their designated class time or in the morning between 8.25 and 8.45am. Reidy Park Primary School’s Resource Centre is managed by School Services Officers. We encourage parents to come into this shared space at any time.